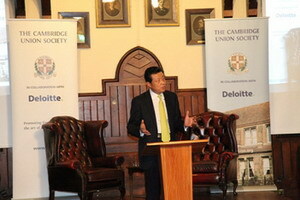 Ambassador Liu Xiaoming answered questions from Cambridge University faculty and students after delivering a speech entitled Let the Golden Era Shine Brighter on 13 November. 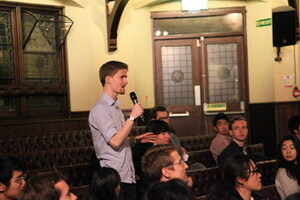 Cambridge student: Although China-UK relations have entered a Golden Era, there are still negative opinions of China in the UK. Some people see China's rise as a threat. Some think China's slowdown pose serious challenges. As Chinese Ambassador, what would you say to those people, how to minimise such suspicion? Ambassador Liu: My job of course is to reach out to every sector of the UK to give a good Chinese narrative, to drive home the importance of China-UK relationship and to promote exchanges and cooperation between the two countries. I don't know how closely you followed the State Visit. Before this State Visit, I gave interviews to all major networks. I call it "full coverage". I appeared in all channels, BBC, Channel 4, Sky News and ITV. I tried to answer various questions such as security issues, such as why China invests in the UK's nuclear power station, and also human rights in China and cyber security. I think it is natural for people to have some misunderstanding, because the media coverage here on China is not comprehensive, sometimes it is one-sided. The media pursues sensational report. If you compare how China is portrayed in this country and how the UK is portrayed in China, there is quite a contrast. My job is also to reach out to the major newspapers, The Times, Financial Times and Daily Telegraph, etc, to have China's voice heard. I also take the initiative to visit the various media and hold discussions with them, because I know even though I give many interviews, they would have 5-10 minutes airtime. The British public will mainly learn about China through the numerous reports written by the British journalists. That's why I try to reach out. I went to the BBC and go behind the scene. I had a 2-hour discussion with over 30 senior editors and journalists including BBC's News Director, the royal and international journalists and tried to answer their questions. I also invited some editors in chief and reporters from the Financial Times and the Daily Telegraph to the Embassy, to brief them on the significance of the State Visit and answered their questions. 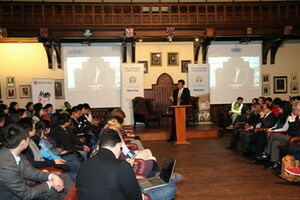 It is also my job as Ambassador to make myself available and come to talk to you here in Cambridge. Cambridge student: I wonder if you could elaborate a little bit on what you said about China and the UK working together on counter-terrorism? Ambassador Liu: Terrorism is a common scourge for humanity. It is a global issue that calls for the joint efforts of all countries. China and the UK are permanent members of the UN Security Council. We shoulder important responsibility for maintaining world peace and stability. The two governments have maintained close dialogue on security and counter-terrorism issues, including sharing information. We are both supporters of the relevant important counter-terrorism resolutions at the United Nations. 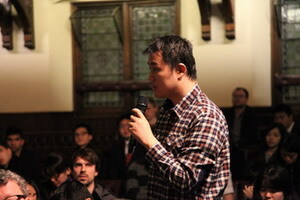 Cambridge student: Recently, there was the historic meeting between Chinese President Xi Jinping and the Taiwanese "President" Ma Ying-jeou. 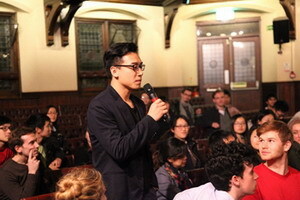 What impacts will it have on the upcoming election in Taiwan and the cross-Strait relations? What's China's view on self-determination? Ambassador Liu: First, I need to correct you for referring to Ma Ying-jeou with the wrong title. There is no president in Taiwan. Taiwan is not a country. It is part of China. There is only one President of China that is President Xi Jinping. Because of outstanding political differences, the meeting was conducted in a practical manner, with both sides attending as leaders of the two sides of the Strait and both sides addressing each other as "Mr". It was a historic meeting and it takes some time for people to fully grasp the significance of this meeting. On the election in Taiwan, we will certainly follow it closely. But what we care more is peace and stability across the Taiwan Strait. In order to maintain peace and stability in the Strait, we must adhere to the one China principle, known as the 1992 Consensus. During the meeting, both sides reaffirmed that relations should continue to be based on this core principle of one China and opposition to Taiwan independence. The 1992 Consensus has been the prerequisite and foundation for political trust and positive interactions in the cross-Strait relations. Abandoning or straying from the 1992 Consensus will throw the cross-Strait relations back into instability. The two sides are yet to be reunified, but China's sovereignty and territorial integrity has never been splitted. Taiwan's separation from the motherland is temporary, and a legacy of history. Japan illegally occupied Taiwan through China-Japan War of 1894. In the Cairo Declaration of 1943, it was explicitly provided that Japan should return to China all Chinese islands Japan illegal seized, including Taiwan and the surrounding islands such as Diaoyudao. When I was Chinese Ambassador to Egypt, I visited Hotel Mena House, the site where the Cairo Declaration was signed by Chinese, American and British leaders. Due to various reasons, Taiwan has yet to return to the motherland. But that does not change the basic fact that Taiwan has been and will always be part of China. I believe the Chinese people on both sides of the Strait have the wisdom and patience to find a peaceful solution and achieve reunification of the motherland. We have waited for over 60 years. The meeting between Xi and Ma shows that our patience has paid off. I have full confidence that more and more people, especially people on the island will understand that it is in the best interest of the people across the Strait to adhere to the 1992 Consensus, promote peaceful development of cross Strait relations, maintain peace and stability in Taiwan Strait for mutual benefit and realise the great renewal of the Chinese nation. Taiwan independence has no way out. 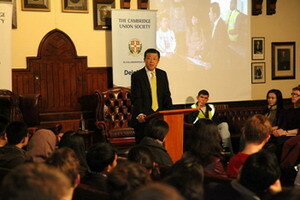 Cambridge student: You said British media is one-sided when reporting on China. I am just wondering what Britain can learn from China? 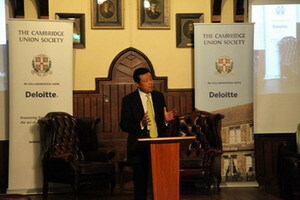 Ambassador Liu: The two countries can learn quite a lot from each other. There are quite some commonalities between China and Britain, including a long history and rich culture. And there are also some differences. First, the Chinese nation is a peace-loving nation that has no tradition of invading other countries. Even when China was at its strongest, for centuries spanning from Tang Dynasty to Ming Dynasty when China GDP accounted for 2/3 of the world's total, which is bigger than the United States today, it has never invaded other countries. The Chinese navigator Admiral Zheng He of Ming Dynasty led a fleet of 200-strong ships on voyages to the Indian Ocean and as far as to Kenya in East Africa. He was there for trade and friendship, occupying not a single inch of land. Zheng He's voyages were much earlier than Christopher Columbus's discovery of America. All these are unimaginable in western history. Even today when it comes to international conflicts, the first thing that comes to our mind is political solution -- how can we address this through diplomatic means -- whereas some western countries think military force is more effective. Our love for peace and a non-military approach is deeply-rooted in China's traditional philosophy and several thousands of years of history. Second, in the Chinese culture, we take a holistic and comprehensive approach when looking at things. There is a Chinese saying that the small streams will rise once the big rivers are full. We put more emphasis on the larger picture and bigger interest of the society and the country, while the Western countries including Britain focus more on details and individuals. Third, we stress the importance of planning ahead and have the patience to execute the plans. China has been making plans every five years since 1953. As I said, we are drawing up the 13th five year plan. It will be a blueprint for China's economic and social development in the next five years. China also has two centenary goals, which show China's ability to make long-term plans. As former US Secretary of State Henry Kissinger said, a single dynasty in China is longer than the entire history of the United States. We are good at thinking for the long-term. Fourth, the Chinese people are hard-working people. Secretary of Health Jeremy Hunt once praised Chinese people for being hard-working people. His remarks drew criticisms. 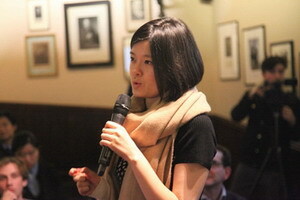 I was asked about it in an interview and I said, the Chinese people are hard-working while British people are creative. China and the UK should step up exchanges and learn from each other. 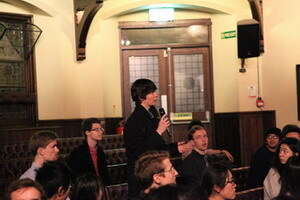 Cambridge student: Will the disputes between the UK and Argentina over Malvinas Islands affect China-UK relations? Should the UK choose to leave the European Union, would that do any harm to China-UK relations? 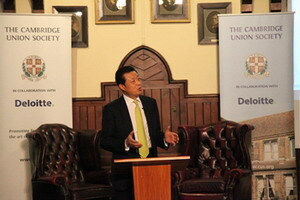 Ambassador Liu: The issue of Malvinas Islands is between the UK and Argentina. We hope it will be resolved peacefully. 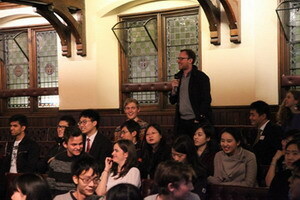 I am happy that this is not a hot issue and this has never been an issue in China-UK relations. With regard to UK referendum on EU membership, it is certainly up to the British people to decide how they want to cast their vote. We certainly would like to have a good relationship with the EU as an institution and individual EU member states. The UK is an important member of the European Union. The British leaders have said on many occasions that the UK wants to be China's best partner in the west and in the EU. The UK wants to take the lead in the early conclusion of the negotiations on a China-EU bilateral investment agreement and the early launch of the negotiations on a China-EU free trade agreement. If the UK leaves the EU, what kind of leading role can it play? We hope the UK will play an important role in the European Union and contribute to China-EU relations. 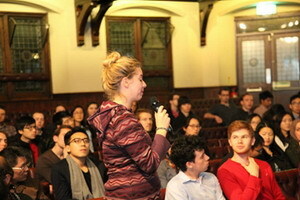 Cambridge student: What would you say to the western allegation that democracy with Chinese characteristics is not real democracy? 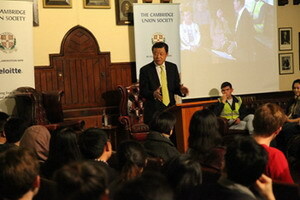 Ambassador Liu: First, we have to share stories about China's democracy. I hope as a Chinese student, you will explain to your teachers and fellow students about China's democracy and how democracy functions in China. Countries are different. Even the UK and the United States, though they speak the same language and share the same cultural tradition, differ in the forms of democracy and legal systems. China has a democratic system with Chinese characteristics, that is, the system of People's Congresses with the hallmark of electoral democracy. The Chinese people form people's congresses at various levels through elections. People's congresses then democratically elect state power organs, executive agencies and judiciary authorities. Deputies at and below the county level are directly elected based on universal suffrage. Deputies above county level are indirectly elected. That is to say, county deputies elect municipal deputies, municipal deputies elect provincial deputies, and provincial deputies elect deputies to the National People's Congress, which will then elect the national leaders. There are nearly 3,000 deputies to the National People Congress. Every year, they meet and every five years there is a general election. As far as we know, the UK has indirect election. The Prime Minister is not directly elected through nation-wide election, but by constituency. Leader of the party that gains majority seats in parliament will become Prime Minister. The President of the United States is elected by the nation-wide election. Again, different from the UK. So you cannot judge whether the system in another country is democratic or not based on your own system. Number one, there is no perfect democracy. Number two, there is no perfect model of a political system. Number three, all countries are different. We can learn from each other. That's why we have various dialogue mechanisms, for example, on governance, rule of law and human rights. The more we carry out such exchanges, the less misunderstanding or misperception there will be. 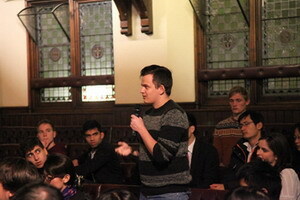 Cambridge student: How, do you think, would western businesses understand the potential and opportunities of the AIIB and One Belt One Road? 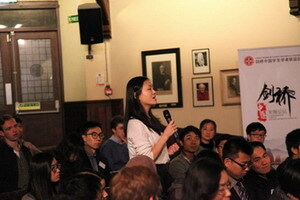 Will the Golden Era of China-UK relations bring any more opportunities to young Chinese people in the UK? Ambassador Liu: Both Chinese and British leaders attach great importance to the AIIB and the One Belt One Road and have extensive exchanges and active interactions about these initiatives. As Ambassador, I will do my best to reach out to share my readings about these initiatives. Various circles in the UK have gained a deeper understanding about the AIIB and One Belt One Road. We certainly encourage young people to go back to China and contribute their talent to the motherland. Every year, we host many delegations from different Chinese provinces. They are here to recruit the bright talent. I hope you can be one of the recruits. Of course, if you choose to stay in the UK, there will also be a lot of opportunities. More and more British companies want to grow their businesses with China and need your help. 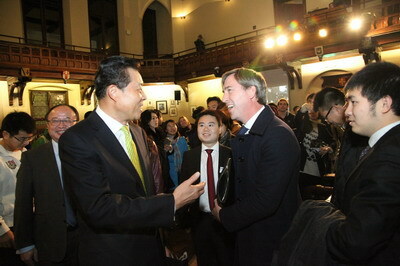 The Golden Era in China-UK relations will surely bring more opportunities to all of you. 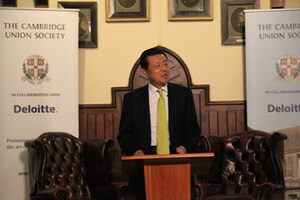 I sincerely hope you will contribute to building the bridges for China-UK exchanges and cooperation. 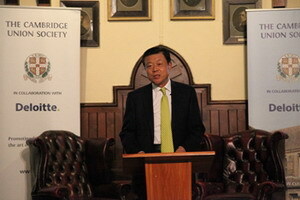 Cambridge professor: China is well on its way to become a super power. How will China balance its relations with the EU and Russia given the tensions in EU-Russia relations? 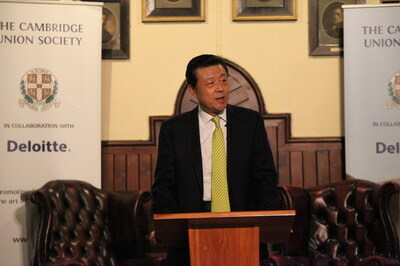 Ambassador Liu: China has cooperative and win-win relations with both the EU and Russia. Russia is the largest neighbour of China. The two countries have close economic and trade ties and good political relations. China-EU relations are also very good. Russia is not an obstacle between China and the EU. I do not feel there is any difficulty for China to grow relations with Russia and the EU at the same time. I don't expect China to be a superpower in the near term. We know our place as the biggest developing country. Although the Chinese economy is the second largest in the world, China's per capita GDP is even behind Romania and Bulgaria, ranking after 80 countries. We very much concentrate on our own development. We must take development as a top priority in our national effort. Cambridge professor: You quoted Charles Dickens in saying that it's the "best of times". But he continues to say it's also the "worst of times". Just two years ago, the Global Times which is owned by Chinese Communist Party said Britain is just an old declining empire only good for travel and study. 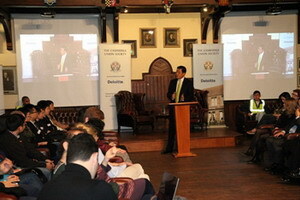 What has happened just in two years that you are talking about this "Golden Era" of China-UK relationship? 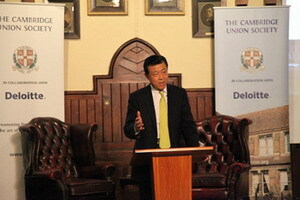 Ambassador Liu: Global Times is one of the media in China and does not represent the Party or the Government. Just like I can't say the comments in British media represent British Government. As Chinese Ambassador, I am here to represent Chinese Government. I always believe the UK is an important country. It is a major country with global influence. As Chinese Ambassador, in addition to telling China's story in the UK, I have also become a good spokesman for the UK in China. When I am on some speaking tours, I am telling people how important the UK is. As an independent media, the Global Times publishes different views. Next time, I will find you comment they made that is very positive about the UK. Cambridge professor: The US Republican candidate Donald Trump has made some negative comments about China. If he is elected US President, how will that affect China-US relations? 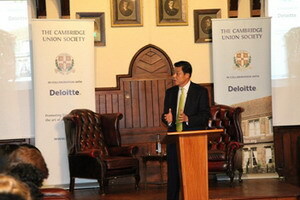 Ambassador Liu: I have worked for many years in the United States. I have been through three elections. I know what American election culture is about. We have to be patient. 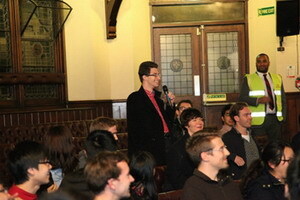 We follow the comments of the candidates. We pay even more attention to the actions once they take office. To quote an English proverb, "Do not count the chickens before they are hatched." 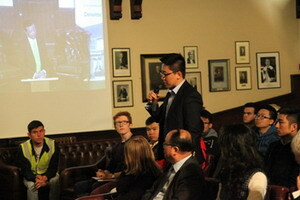 Cambridge student: How can China and the UK work together in high-end manufacturing? Ambassador Liu: There are many areas of great potentials and opportunities for China-UK cooperation, high-end manufacturing is one of them, the latest example being the jumbo jet. Rolls Royce is one of the two biggest engine producers in the world that is expanding cooperation with Chinese companies. The manufacturing of aircrafts is very complicated. It involves over a thousand businesses. This can massively increase jobs and drive the economy. The UK has realised the shortcomings of over-reliance on financial services. It has adopted strategies to reinvigorate the manufacturing sector, which holds great potentials for China-UK cooperation. The UK is also a leader in automobile industry. The Shanghai Automobile Industry Corporation bought MG. They set up a research centre in Long Bridge. They retained all 300 technicians and scientists. SAIC CEO told me that they have benefited from both MG's design and manufacturing. Geely bought London Taxi. They are working with British scientists and technicians to make environmental-friendly electric taxis. During the State Visit, President Xi and the First Lady were accompanied by the Duke and Duchess of Cambridge on a view of the prototype of the new taxi. I believe it won't be long before all London taxis will be environmental-friendly and energy-conserving models. Besides, China and the UK have carried out good cooperation in green energy, telecommunications, robot, aviation and aerospace. I believe as China-UK relations enter this Golden Era, China-UK cooperation in high-end manufacturing will embrace an even brighter future.